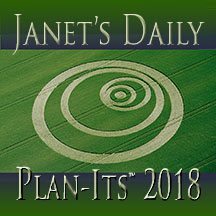 Janet’s Daily Plan-its™ 2018 is Janet’s ebook astrological forecast calendar for 2018. (There is no printed book, only a cyber-space version.) Janet is almost done with the finishing touches and it will soon be ready to order in a choice of digital download formats, either Kindle or ePub for other ebook readers. (Later, there may be a PDF which you can print yourself.) The new price for the electronic version is very user friendly at $8.99 U.S. (Connecticut customers will be charged the requisite 1% state sales tax for digital downloads.) The information in Janet’s Plan-its™ is geared toward North American time zones and the day ratings are not applicable elsewhere. The beautiful cover design by Beth Turnage uses a May 30, 1999 photograph of a crop circle in a barley field in Penton Grafton, Hampshire, England, © Steve Alexander. When you have time to explore, you’ll want to see more of Steve’s amazing aerial photographs of crop circles at www.temporarytemples.co.uk. For years, Janet’s Plan-its cover images have shown stars in deep space, planets in our solar system, our sun, our moon, the northern lights and Earth from the Moon. This year, the cover celebrates the cosmic celestial symbols in the mysterious phenomenon of crop circles. This one looks like nesting crescent moons, suggesting cycles within cycles. This digital version has the daily information that customers have come to rely on (day ratings, daily messages, Moon signs and Void Moon periods), along with the essential and unique Best & Worst Days list and an extensive Commentary section. A new feature is all of each month’s day ratings listed in table form for easy reference when scheduling your important plans. Janet’s handy free PDF 2018 On a Page bar chart of the year’s Retrogrades and New and Full Moons is available now in the Study Booth. The 2019 On a Page is posted, too, for those of you who need to look further ahead. Enjoy!